Cuba is a colorful country with warm and friendly people, Spanish colonial cities and 3,500 miles of unspoiled Caribbean coast line, making it one of the most sought after destinations in the Caribbean. We’ll take you to the heart of it all. Join insightCuba, the most trusted name in legal people-to-people travel and get an inside look at two of Cuba’s most popular cities, Havana and Varadero. We’ll show you what makes each of these cities so popular, with people-to-people excursions that let you dive right in. Arrive at Varadero’s Juan Gualberto Gómez Airport. After clearing immigration and customs, you’ll head to the Meliá Varadero resort for check-in, lunch, and orientation*. Then we'll head to the town of Varadero to meet with a local ceramic artist at his workshop. Later we’ll return to the hotel for a welcome dinner. *Check-in begins roughly at 3pm ET. The tour start time will vary slightly depending on flight arrivals. After breakfast, we'll go on an excursion to Cardenas, a small town just south of Varadero, for a visit to the farmer's market. After, visit the Sugar Cane Museum to learn about sugar processing and how sugar cane is used to make Cuba’s infamous rum. Then ride the famous Sugar Cane antique train. We’ll return to the hotel for lunch. After lunch, we’ll visit the Varahicacos Ecological Reserve, known for its hiking trails and unique flora and fauna. We'll visit one of the areas’ caves where pre-Columbian pictographs and 2000-year old burial plots can be found. After breakfast, we’ll drive along the beautiful coast for a day of exploration in Havana. We’ll begin our full-day excursion with a walking tour in Old Havana, a splendid UNESCO World Heritage Site and one of the most incredible examples of preserved Spanish Colonial architecture. You’ll stop for a visit at a local artist studio before getting a special panoramic look at this historic neighborhood. After lunch on your own in Old Havana, we'll visit the Museum of Fine Arts. Afterwards, we'll hop into a restored pre-1959 classic American car and cruise over to the Hotel Nacional for some great views. After dinner on your own, we’ll return to our hotel in Varadero. After breakfast, bid farewell to Cuba as you board your flight home. Please note that this itinerary is subject to change. Due to the unique nature of our programming, each departure is custom designed and not every activity listed on this itinerary is always available. Please rest assured that our team in both Cuba and the U.S. take special care in planning each excursion and draws from almost two decades of experience, relationships, and activities to make each itinerary exceptional. Each tour provides a full-time schedule of educational people-to-people exchange activities and is fully compliant with U.S. Department of Treasury, Office of Foreign Assets Control regulations regarding travel to Cuba. These same regulations provide that guest participation on each tour is mandatory. *For Private Departures: Three breakfasts, lunches, and dinners on own. **Only one round trip transfer is available for recommended flight arrival and departure times. All others will transfer via taxi. ***Customary end-of-tour gratuities for the Cuban guide, driver, and tour leader are left to the guest’s discretion and should be based on your satisfaction with the level of service received. About: Travel with an intimate group of like-minded travelers to share experiences and make new friends. It’s our most popular choice and allows you to save on your trip. Average group size is 12 guests. For Private Departures for only you and your companion(s), please scroll to the next section. PREPAYMENT DISCOUNT: Pay in full at the time of booking and receive $200 OFF the full price! Must book 120 days in advance of the departure date. This may not be combined with any other promotions. Normal terms and conditions apply. GROUP RATES: 5% off land for groups of 5 - 9 guests. 10% off land for groups of 10 or more. Not combinable with any other offer, private departures, or custom-made tours. Will be applied at final payment. CHILD DISCOUNT: Discount applicable only with two full paying adults. Adults and children must stay in the same room. Terms: Children must be the prescribed age above at the time of travel. Discount applies only to Varadero+Havana Getaway package and does not include air or Cuban visa. About: Select your favorite Signature Cuba tour, dates of travel, and your fellow traveler(s) and we’ll set up everything... just for you. Once you have booked your tour, our flight concierge will gladly assist you with all your flight needs. Call us at 914-380-8303 or click here for an air quote. Please note that domestic and international flight costs are not included in your tour or travel package. Flight times may vary, please consult the airline's website for the most up to date flight information on your particular dates of travel. *Group airport transfers are included for recommended flights only. Recommended flight and group airport transfers - Group airport transfers in Cuba are provided for recommended flights only. If you require a transfer from the airport to the hotel, please either book the recommended flight above, or call our flight concierge team to assist you. Non-Recommended Flights without group airport transfer - You may book a flight other than the recommended flight, however, group airport transfers are not included. To join the group or meet your tour guide, you will need to take a taxi from the airport to the hotel, at you own expense, on both arrival and departure day. Airport transfer costs from the airport in Varadero to the hotel generally cost CUC$25 (US$30) each way. Authorized airlines - Not all airlines are authorized by the U.S. Department of Transportation to fly to and from Cuba. American Airlines is the only airline to provide service to Varadero, Cuba. While this information may change, the currently authorized airlines are: American Airlines, Delta Air Lines, JetBlue Airways, Southwest Airlines, and United Airlines. Please contact the carrier for up to date flight schedules and routes. 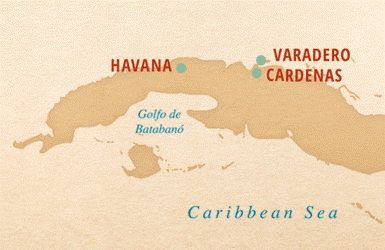 Correct Airport - Please note that flights for this tour are round trip to Varadero, Cuba, and not Havana. If you purchase air on your own, please make sure to book the proper airport or destination. Booking the wrong airport can result in expensive ticket change fees, or airport transfer.